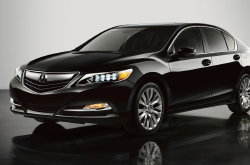 As the successor to the RL, the brand-new 2014 Acura RLX has some pretty big shoes to fill. The good news is - according to the latest Acura RLX reviews - the lineup's new flagship sedan is more attractive, more capable and more exciting than its predecessor. With technologies like Precision All-Wheel Steer, Jewel Eye LED headlights and the newest version of the AcuraLink infotainment system, the 2014 RLX sets itself apart from both the RL and its closest segment competitors. On the outside, its sleek, contoured design exudes confidence and luxury appeal with a low stance and formidable front fascia. Acura's bid to re-enter the competitive mid-size luxury sedan segment is by all weights and measures a real success. The 2014 Acura RLX is available in Phoenix in five trim levels, each named for the package that accompanies the car: RLX, RLX Navigation, RLX Technology, RLX Krell Audio and RLX Advance. An RLX Hybrid will be released toward the end of this year. All non-hybrid sedans will feature a direct-injected 3.5-liter V6 engine with 310 horsepower. Paired to a six-speed automatic transmission and Acura's new Precision All-Wheel Steer technology, the 2014 RLX delivers an exhilarating ride and nuanced driving dynamics. Standard and optional features on the new 2014 Acura RLX in Phoenix include: keyless entry/push-button start, leather seats, a rearview camera, a sunroof, full power accessories, tri-zone climate control, a 10-speaker ELS audio system with HD radio, navigation, the AcuraLink infotainment system, wood interior accents, noise-reducing glass, and heated and ventilated seats. Safety is never an issue in the RLX; with adaptive cruise control, a collision warning and mitigation system with automatic braking, lane assist, and front and rear parking sensors, drivers can be assured of 360-degree protection. To learn more, continue reading the 2014 Acura RLX review below or contact Acura of Peoria, located near Phoenix in Peoria, AZ.